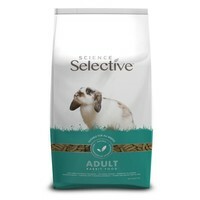 Science Selective Rabbit Food is a mono-component, complete diet for rabbits, designed to combat the specific problem of selective feeding. Premium Ingredients - Incorporates a blend of premium quality raw materials extruded into a highly nutritional and palatable biscuit. Fibre - Contains a high level of fibre (25%) to promote gut motility, healthy digestion and even dental wear. Bio-Moss - A prebiotic which boosts immune function, aids digestion and improves caecal consistency. The prebiotic acts on harmful gut bacteria, allowing the beneficial bacteria to flourish. The average adult rabbit will need approximately 50gms a day of Science Selective Rabbit. I did some research and this seems the best on the market for bunnys health. I've been using it for years, My bunnies really liike this and my vet always comments what good teeth my rabbits have.